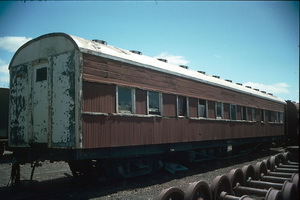 Timber bodied 60 foot first class sleeping car built by the Commonwealth Railways at the Port Augusta workshops for the Ghan, with 18 sleeping berths, shower and conductors compartment. 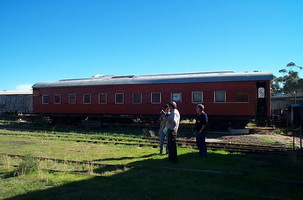 One new first-class sleeping car for the Central Australia Railway was completed during the year and placed in running. The construction of this car embraces an all-welded underframe and bogies and also the use of masonite for exterior sheathing. The interior of the car is finished in walnut plywood. The car body has been insulated and designed for air-conditioning at a later date. Sleeping compartments in the car are all all of the two berth type. 25.7.1971 Recoded as Breakdown consist sleeping car "NXEA 73" for use on the North Australia Railway. 1978 Sold to Pichi Richi Railway.